In a large bowl sift 1 cup confectioner’s sugar, the cocoa powder and allspice. Stir in rum and corn syrup. Stir in Vanilla Wafers and walnuts. Place in refrigerator to firm up about 30 minutes. The mixture may appear to be crumbly/dry. This is okay. Place ½ cup confectioner’s sugar in a shallow bowl. Using 1 Tablespoon scoop out portions of chocolate mixture and form 1-inch balls. 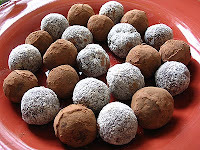 Using hands roll balls in Confectioner’s Sugar (you can also roll the balls in cocoa powder), coating evenly. Place on baking sheet and cover with plastic wrap. Refrigerate overnight. Store in an airtight container in refrigerator up to two weeks placing waxed paper between layers to prevent sticking.